Inorganic crystalline silicon solar cells account for more than 90 percent of all installations worldwide despite a recent surge in research efforts to develop new materials (organics and perovskites) and solar cell architectures. In recent work reported in Nano Energy (« Direct-gap semiconducting tri-layer silicene with 29% photovoltaic Efficiency »), Chen, together with Professor Yanchao Wang (College of Materials Science and Engineering, Jilin University, China) and their coworkers predicted that tri-layer silicene is an ideal candidate for high-efficiency photovoltaic absorbers. He adds that the 1 µm-thick tri-layer hex-P2/c- 2×2 silicene could be experimentally engineered by van de Waals stacking. The team used the swarm-intelligence CALYPSO code to search for the energetically most favorable phases of silicene from monolayer to penta-layer. The lowest-energy tri-layer silicene predicted (denoted as hex-P2/c-2×2) consists of alternating arrays of six-membered Si rings. 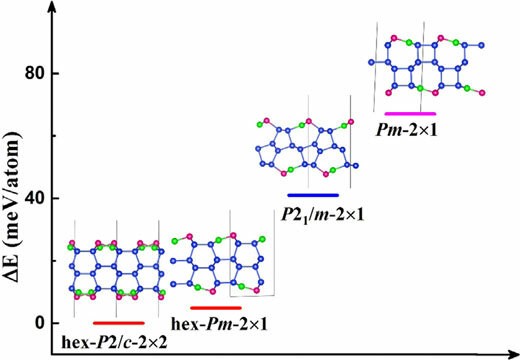 The hex-P2/c-2×2 silicene is semiconducting with a quasi-direct band gap, and is energetically more favorable than the previously reported P21/m-2×1 structure. The indirect-direct band gap transition can occur upon a small external strain in the hex-P2/c-2×2 tri-layer silicene. « Bulk GaAs has the highest conversion efficiency among thin-film solar cell absorbers, and the estimated photovoltaic efficiency of this tri-layer silicene is as high as 29%, comparable to bulk GaAs (32%), » notes Wang. Therefore, the authors believe that the hex-P2/c-2×2 phase holds great potential as ideal candidates for high-efficiency photovoltaic absorbers. « Our study not only identified promising materials for flexible and wearable photovoltaic devices, but also provides a general method to study the geometric structure and electronic property evolution for 2D materials with nonlayered bulk counterparts, » he adds. In recent years, black phosphorus (BP or phosphorene), a novel two-dimensional (2D) semiconducting material, has gained tremendous attention because of its intriguing properties, such as ON/OFF ratio, high carrier mobility, and tunable direct band.